One of the most important decisions you will make when installing and setting up your aquarium is the stand. 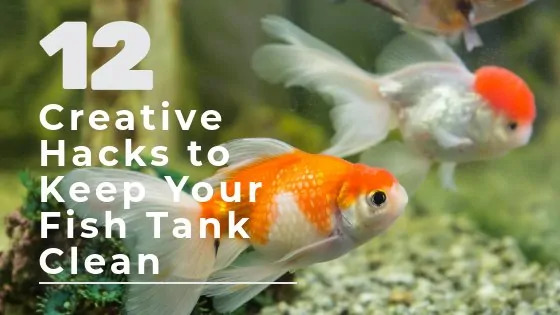 It is not recommended that you just put your fish tank somewhere temporarily as a full tank can be extremely heavy and almost impossible to move afterwards should you want to put it somewhere else. Also, it is not recommended to put your tank on just any piece of furniture as this piece may not be capable of withstanding the weight of the water. There are many different models and designs for aquarium stands on the market. Let’s look at the best 55 gallon fish tank stand. What are the advantages of using an Aquarium Stand? Caitec TitanEze Aquarium Stand 55 Gal. When shopping for the furniture that your aquarium will rest on, you will notice the wide variety of styles, designs and colours out there. It may get confusing to navigate all these available choices. The first thing you need to look for and this will narrow down your choices to specific models, is the size of your tank. The amount of gallons that you have will determine what type of stand you will need. The stands will come with information regarding the volume of water that it can bear. This is very important because you don’t want to purchase a cheaper model that can only support a 20-gallon tank when you have a 55-gallon. 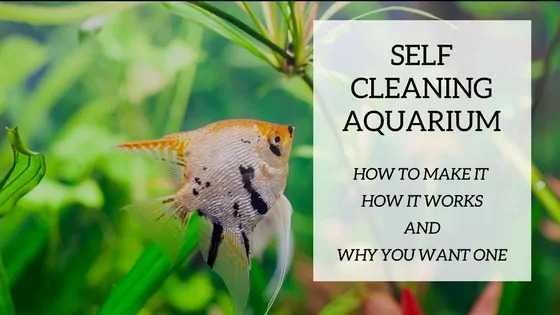 You may be putting your aquarium and your fish at risk by purchasing something that is not adequate. If you are just starting out with fish keeping, you may be interested on knowing more about what size is best to start with. We have this covered in depth here. The media that your aquarium is made of will impact your choice selection. If your 55-gallon aquarium is made of glass, you can rest it on a stand that has edge support only. If your tank is made of acrylic, you will need to choose a stand that will support the entire bottom of the aquarium. 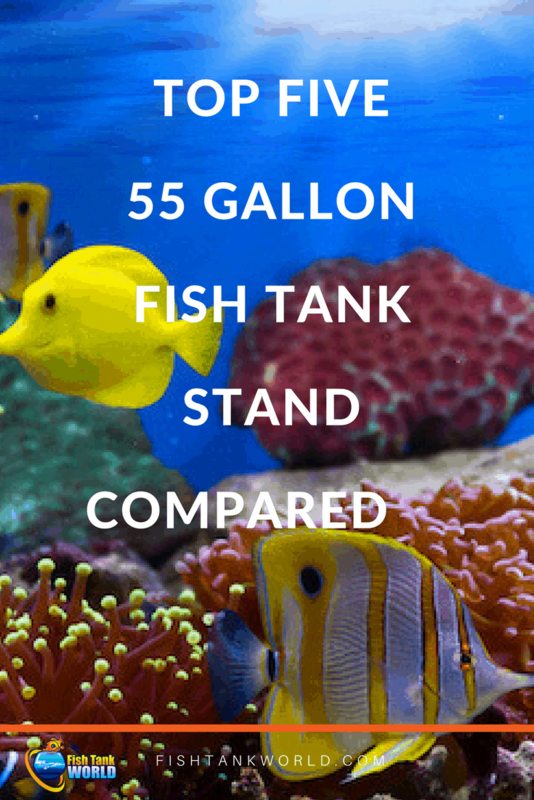 A 55-gallon tank will weigh close to 550 pounds when full. You will need to put it a spot that can support this amount of weight. It is not recommended you put it in the middle of a room as it may make the floor sag. You will want to put it in a place near a support beam. Where will your aquarium be: in a room in your house or at your office? The style and size of the room where it is going to live will have an impact on the model that you will get. 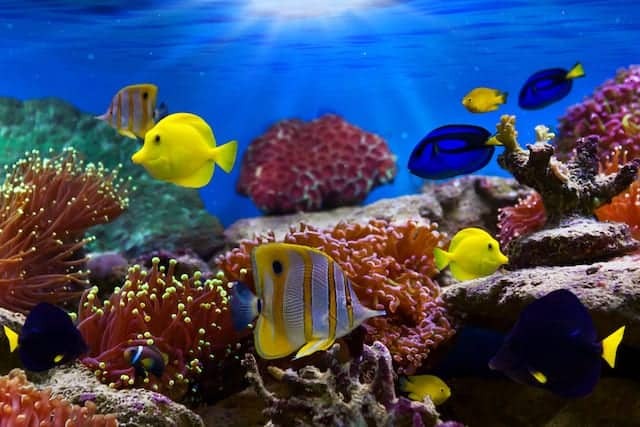 You want to incorporate your aquarium into the room and have it flow with the rest of the furniture and decorations. You don’t want an eye sore that looks out of place. There are different types of stands, but most are made from metal, wood, and sometimes mixed media. The metal stands are popular and are generally less expensive than the wood ones. The metal stands are usually made for the glass aquariums as they will only support the edges of your tank. Make sure that the metal has been treated for corrosion resistance. You wouldn’t want to end up with a rusted aquarium stand. The only thing about the metal stands is that they lack storage like the wood ones normally have. If you have a canister filter or a sump that fits under the tank, then it is sometimes best to choose a stand with cabinets to hide these accessories. The wood stands are a very good choice and the only choice if you have an acrylic tank. They often feature cabinets and drawers where you can store your aquarium accessories and filters. They come in different types of wood, make sure that it is treated for moisture resistance and powder coated so that it can take some occasional water without sustaining any damage. The metal stands will be less expensive then the wood ones, but this is not an option if you have an acrylic tank. This is an expensive accessory that you will have to invest in. 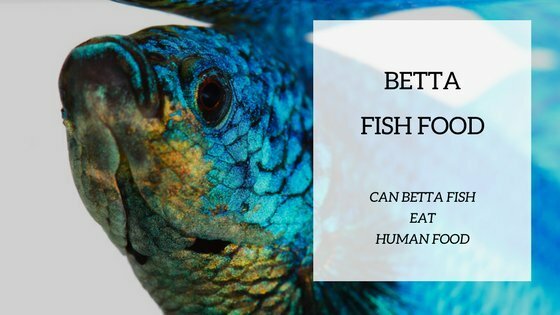 It is a very important choice that you will make and you don’t want to purchase something cheap that will not resist water and may put your fish in a harmful situation of a possible accidental fall. Purchasing an appropriate aquarium stand is essential to assure the safety of your tank and of your fish. This is a very important accessory and it cannot be overlooked. You will have to choose a stand that meets the requirements to withstand some occasional water and can support the weight of your full tank. Your aquarium will definitely look better on a stand that was created for that purpose. They are usually dark colors or natural wood that blend in very well with most home interior designs. You don’t want something that will be too colorful and take away the attention of your fish and habitat that you work hard at. You want to make sure that the media it is made of is solid and will be durable. A cheaper stand will probably be made of cheap material and will not last as long as a more expensive one that is most likely made of a better media. This is especially true for the wood stands. Wood stand may be made of solid wood or particle wood. The particle, or fiber wood, will be less expensive and lighter, but may not resist as much as a solid wood one. Make sure to check that the metal has been treated for corrosion resistance and the wood has been treated as well to accommodate some occasional water without damaging it. Verify that the wood has been treated with a dark powder coat to add to the moisture resistant feature. One nice feature that some stands have is adjustable feet. Your aquarium needs to be level to minimize possible cracks and water damage. If the stand comes without adjustable feet, here is a short video explaining how to level your aquarium yourself. Here are our top five picks of the best 55-gallon fish tank stands on the market today. This 55-gallon aquarium stand will accommodate most 55-gallon tanks. It has a full top support for all aquariums. It has hinged doors that make it very practical to conceal canister filters, sumps, and other aquarium accessories. The top, base, and door are moisture-resistant and powder coated for extra protection from the possible water damage that may occur. It is easy to assemble and you can choose the color of the reversible door, it comes in black on one side and cherry on the other. This is a very nice design feature. It is on the pricier side, but it is of high quality mixed media. The stand doesn’t have any adjustable feet to level it as others do. The Aquatic Fundamentals 55-Gallon Upright Aquarium Stand will beautifully and sturdily support your rectangular 55-gallon tank. It has a moisture resistance and black powder coat finish to avoid water damages to the stand. The design is contemporary and fits a variety of interior decors. It is made very robust and will support your aquarium without a doubt. Some owners have mentioned that it can be a little complicated to assemble. It is made of particle wood, which gives it a very interesting and affordable price, but is not high quality. It has shelving and storage space to keep canister filters, sumps, and other aquarium accessories. The Double Aquarium Stand 55- gallon is made of sturdy durable solid metal. This stand can hold two 55-gallon tanks securely. It has only edge support, so cannot be used with an acrylic aquarium. It is lightweight and very easy to assemble. It is said to be a little wobbly and it is recommended to attach it to the wall with braces for extra support. It has a little metal design feature at the top that can be either liked or disliked. Some users who dislike this feature have turned it around to face the back. This modern looking aquarium stand is moisture resistant and powder coated for extra water protection. It is made of wood and metal and has a solid fiberboard top for added stability. It can be used for any 55-gallon glass or acrylic tank. It features shelves that make storing your canister filter, sump, and other aquarium accessories a cinch. It possesses easy metal to metal locking cam assembly making it sturdy and durable after assembly. It is a different design than most standard aquarium stands and that makes it very interesting if you have a modern décor. It is also very affordable compared to other stands. The Imagitarium Brooklyn 55-Gallon Metal Tank Stand is made with durable solid metal. This model features adjustable feet to level the stand. It is quite a modern look and can fit in many different decors, be it in your home or in your office. This stand is made for glass aquariums only as it has edge support only. It is very inexpensive and is know to be sturdy. Assembly is easy, but it has been known to leave a gap at the top assemblage area. When it comes to choosing your aquarium stand, you need to keep a few factors in mind in order to make the right decision. You need to buy the proper stand with the proper weight requirement making sure that the stand can bear the amount of gallons that your tank has. Also you need to know what media your aquarium is made of because the metal, edge support tanks will not sustain acrylic tanks. Another important factor is the look of the stand. You need to keep your decor into consideration when shopping for your stand and make sure that it blends in with the rest of your furniture in the room where it will live. Our top pick for the 55-gallon aquarium stand is the Aqua Culture Deluxe Aquarium 55-Gallon Stand because it is sturdy, easy to assemble, and has storage units that make hiding filters, sumps, and other accessories hassle-free. It is good for both glass and acrylic tanks and is moisture protected and powder coated to prevent water damage. The look of the Aqua Culture Deluxe Aquarium 55-Gallon Stand is very elegant and fits a variety of home decors.